In the past, we used to be able to just drop and go anywhere, anytime. That all changed when BabyE became a lifetime member of FOOD FOR BUDDHA. Nowadays, it takes an extra twenty to thirty minutes just to attempt to leave the house. Yes, attempt is the keyword. Late-night eating has also changed a lot for us. You see, her highness, BabyE, somehow turns into a pumpkin (an adorable one, of course) by about 11pm every night and demands her beauty sleep. To accommodate her call, we must limit ourselves from dining out late, especially if the restaurant is too far away from home (i.e. Richmond). 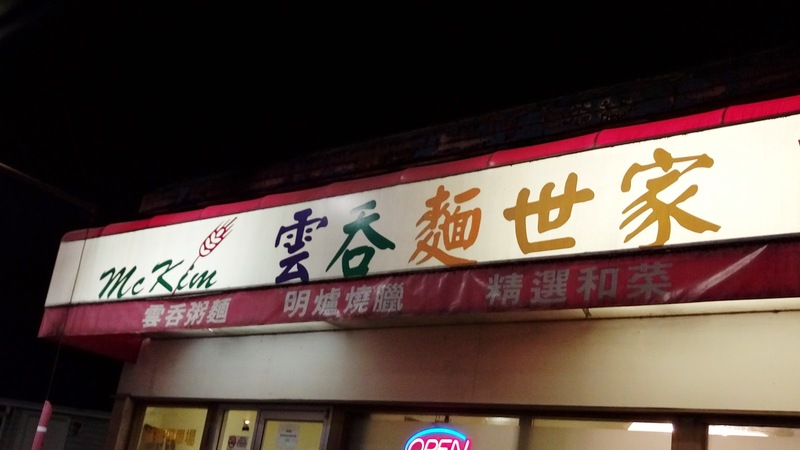 Lately, we've been on the hunt for late-night hubs around our neighborhood and McKim Wonton Mein Saga 雲吞麵世家 came into the picture. I recall that we visited this restaurant years ago (never blogged about it though) and left with disappointing tummies. Years later, after hearing about their late-night menu, Buddha Boy and I thought it's time for another try. Unfortunately, we arrived a bit too early for the late-night menu so we ended up ordering a two-item combo dinner. Complimentary soup of the day was included in the combo set and it was presented in a Chinese pottery cooking urn. Pitahaya Flower & Pork Bone Soup 霸王花煲豬骨 was the featured soup of the day. 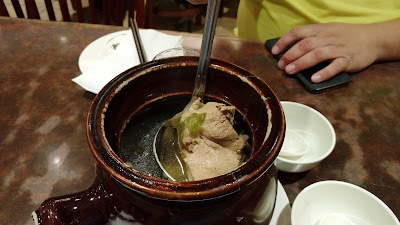 The pot had fibrous strands of the dragon fruit flower with large chunks of lean pork meat. MSG was quite noticeable in the broth. 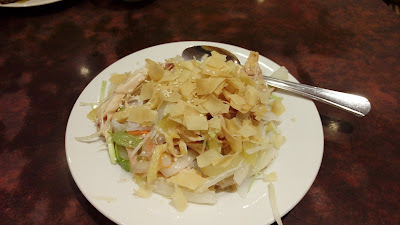 Since we ordered two items from the combo dinner menu, we were also given a complimentary plate of Shredded Chicken with Bean Noodle 手撕雞. Sprinkled with white sesame and topped with spring roll wrapper crisps, the plate had very small amount of chicken with mostly noodles and fillers of Chinese sauerkraut, celery and carrots. Not only this was overly sweet (from the sweetened Chinese sauerkraut), this was also overly salty. 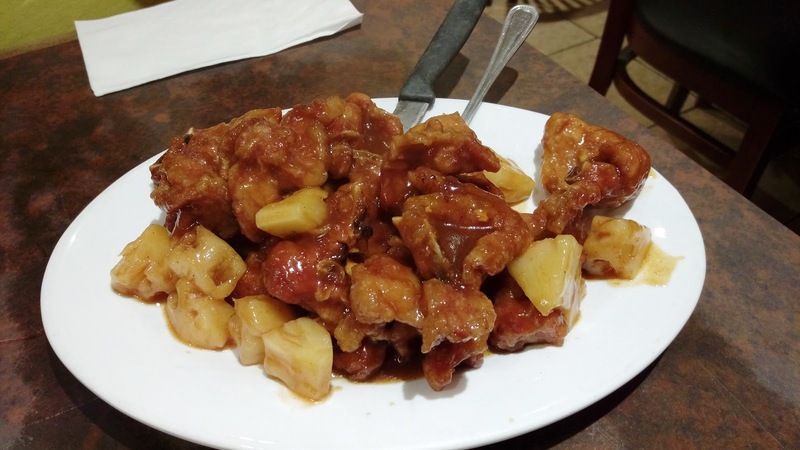 Next came Peking's Sweet & Sour Pork Chop 京都豬扒. The chops were meaty but overcooked. And because the chops were overdone, that thick layer of batter coating the meat had an unbearable crunch. The HP-based sweet and sour sauce was quite salty. The fresh pineapple chunks were the only thing we enjoyed. 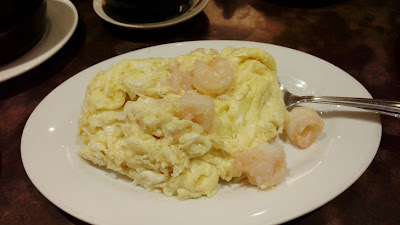 Anyhow, the plate had fair amount of eggs with sufficient number of shrimps to balance the ratio. Accented with leek sprouts, the eggs were smooth but were not fluffy. The dish was underseasoned. On top of the two-item dinner combo, we added two more items off the regular menu. The first was an unsatisfying order of Pan Fried Oyster Omelet 香煎蠔烙. What's so depressing about it? First of all, the omelet had almost zero oysters. Secondly, the omelet was unreasonably thin. Next, the omelet was bland and lacked savoriness. 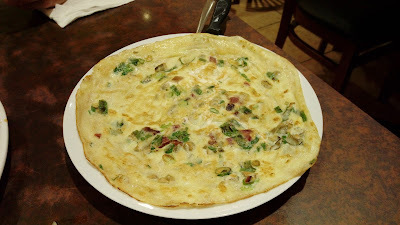 Finally, and most importantly, chunks of Chinese sausages do not mingle well in an oyster omelet. DO NOT ORDER THIS! 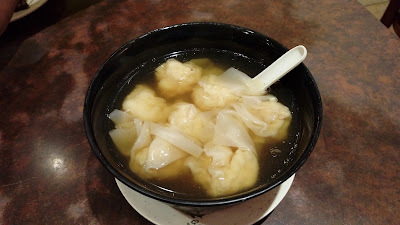 The second regular menu item was a bowl of Shrimp Wonton Soup 淨雲吞. For the price, portion was acceptable with eight decent-sized wontons. The shrimp had a nice crunch but the overall filling was salty. 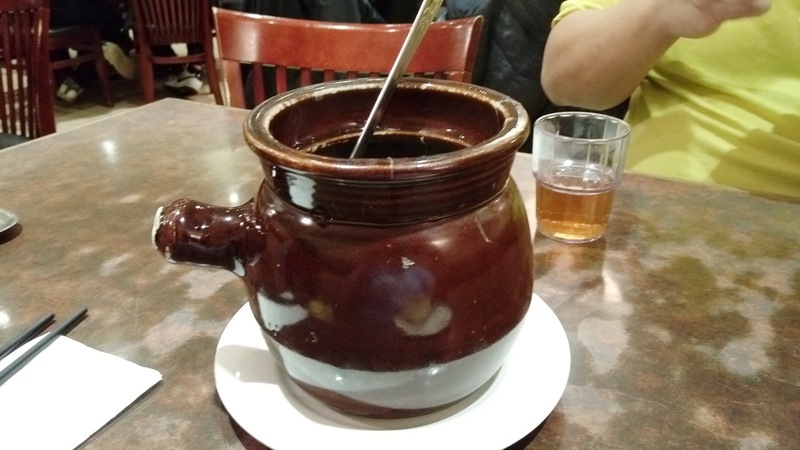 The broth was also salty. 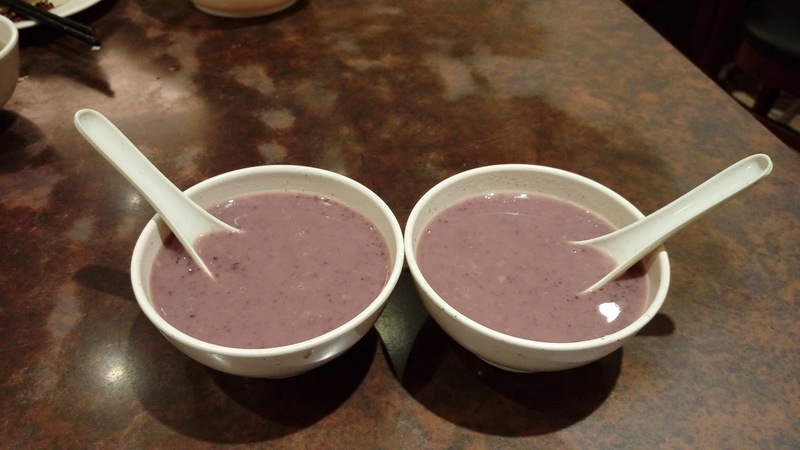 Our meal ended with two complimentary bowls of Black Glutinous Rice with Coconut Milk 椰汁紫米露, one of the typical complimentary desserts in Cantonese-style Chinese restaurants. Pricing was so-so. Food was mediocre. Quantity was average. Service was inadequate. Honestly, unless we're desperate, we would not return, again.